HULK VS. WOLVERINE The Incredible Hulk has been tearing a line across the Canadian wilderness, leaving a swath of destruction in his wake. He has to be stopped, and thereas only one man up to the job. Heas the best at what he does, but what he does isnat very nice. 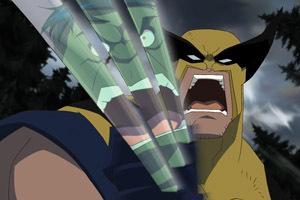 Heas Wolverine, an elite agent of Canadaas top secret Department H, and heas been put on Hulkas trail with a single objective: stop the green goliatha]at all costs. Hulk and Wolverine are about to enter the fiercest battle of their lives. 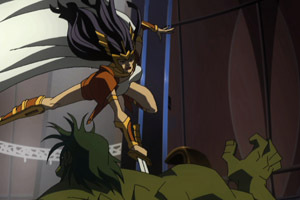 HULK VS. THOR Itas gods versus monsters in this epic forty-five minute movie. For ages, Loki the trickster has sought a way to bring defeat to his accursed stepbrother, Thor. But for all the battles Thor has fought, in all the nine realms, only one creature has ever been able to match his strengthaa mortal beast of Midgard known as The Incredible Hulk. Now, with Odin the king of the gods deep in a regenerative sleep, and the forces protecting Asgard at their weakest, Loki is finally ready to spring his trap. 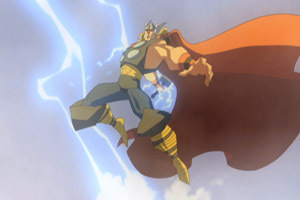 In a classic battle that will test a heroas limits more than ever before, only the mighty Thor can hope to prevail. 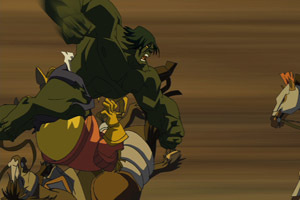 Marvel Animated Features premieres two all new action-packed films together on one release - Hulk vs. Wolverine and Hulk vs.Thor. 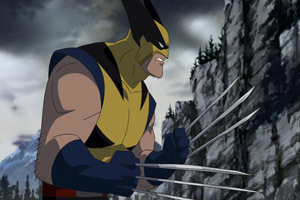 Hulk vs Wolverine: Alberta, Canada. The Incredible Hulk has been tearing a line across the Canadian countryside, leaving a swath of destruction in his wake. He has to be stopped, and there's only one man up to the job. He's the best there is at what he does, but what he does isn't very nice. He's Wolverine, an elite agent of Canada's top secret Department H, and he's been put on Hulk's trail with a single objective: stop the green goliath...at all costs. Hulk and Wolverine are about to enter the fiercest battle of their lives. 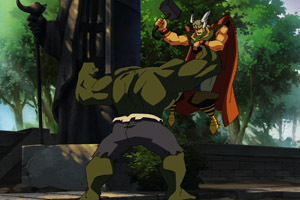 Hulk vs. Thor: Asgard, realm of the gods. For ages, Loki the trickster has sought a way to bring defeat to his accursed stepbrother, Thor. But for all the battles Thor has fought, in all the nine realms, only one creature has ever been able to match his strength - a mortal beast of Midgard known as The Incredible Hulk. Now, with Odin, the almighty king of the gods, deep in a regenerative sleep, and the forces protecting Asgard at their weakest, Loki is finally ready to spring his trap. In an epic battle that will pit gods against monsters, that will test a hero's limits more than ever before, only The Mighty Thor can hope to prevail.